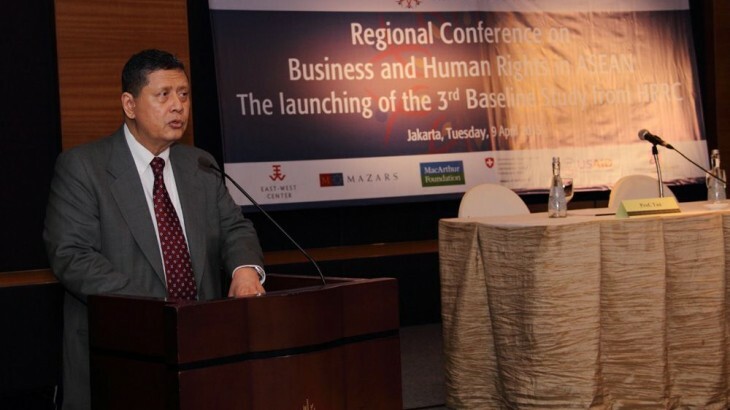 The third baseline study of Human Rights Resource Centre was launched on April 9, 2013 in Jakarta. 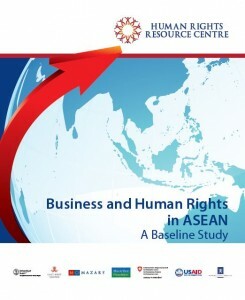 The regional conference was attended by the team of rapporteurs and advisors of the study, the diplomatic and business community, representatives from AICHR, National Human Rights Commissions in ASEAN countries, the UN Global Compact Network in ASEAN countries, Partner Institutions of HRRC and civil society organizations from the Southeast Asia region. The Deputy Speaker of Indonesian Parliament, H.E Priyo Budi Santoso, gave the keynote speech following the expressions of support from the Swiss Ambassador to Indonesia, H.E Heinz Walker-Nederkoorn, the Norwegian Ambassador to Indonesia, H.E Stig Traavik, the US Ambassador to ASEAN, H.E. David Carden and the President Director of Mazars Indonesia, James Kallman. The commentary for the study was provided by Dr. Makarim Wibisono, the Executive Director of ASEAN Foundation during the plenary session moderated by Prof. Harkristuti Harkrisnowo where the 2 of 3 advisors to the Study, Prof. Christine Kaufmann and Prof. Kevin Tan presented the findings and recommendations of the Study. The Rapporteurs from each country then presented their findings in the breakout sessions of the regional conference.